SCHOOL IN ACTION NIGHT: MMS School in Action Night is THURSDAY, MAY 18th at 7pm and you won’t want to miss it! Bring the whole family and come see the incredible showcase of our students’ talent and hard work. More info can be found HERE. Don’t forget it’s a 4-hour day -- 12:30pm dismissal and lunch is not served. 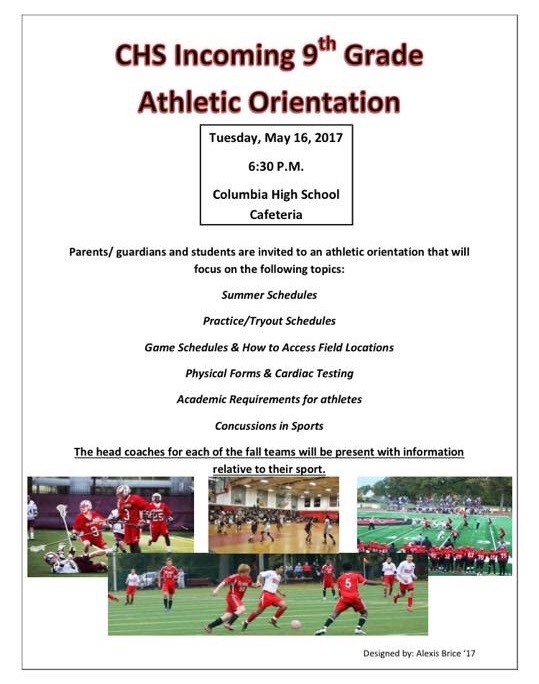 CHS INCOMING 9th GRADE ATHLETICS ORIENTATION: Attention all 8th grade families -- on TUESDAY, MAY 16th at 6:30pm come to the CHS cafeteria for a 9th grade athletics orientation. More info can be found HERE. MMS GARDENING DAY: On SUNDAY, MAY 21st Ms. Silva and parent volunteers invite all MMS families to come help plant in our gardening beds. Save the date and be on the lookout this week for more specifics. CHS PROM DONATION: CHS is accepting donations for prom (dresses, suits, jewelry, handbags, shoes, etc.) up until MONDAY, MAY 15th. Items can be left at the CHS front desk. It’s the perfect time for spring closet cleaning and all fun and fancy donations will be truly appreciated! ACHIEVE HONOR YOUR TEACHER AND STAFF TRIBUTE CAMPAIGN: Attention all 8th grade families -- The Achieve Foundation is conducting its Honor Your Teacher and Staff tribute campaign. Students and families are invited to write personal thank you notes to teachers and other staff members who have made a special impact on their learning experience. The money raised is directed to next year’s educator grants. Sending these cards is a great way for parents and students to express their appreciation at graduation or moving up time. Please check out the website http://achievefoundation.org/honor-your-teacher/ or click HERE for more info on this terrific program. COUGAR MARCHING BAND REGISTRATION: Attention 8th grade families -- Registration for the 2017-18 Cougar Marching Band is open! Click HERE to register by June. If you have any questions, please contact Mr. Bauer at pbauer@somsd.k12.nj.us. ADULT SCHOOL SUMMER PROGRAMMING: The South Orange-Maplewood Adult School Children’s Summer Program runs from June 26-July 21 and offers more than 100 classes in creative arts, music, science, and sports. Students in first through ninth grades get to choose their own classes (there are five periods in a day) and the day can be as long or short as you like. This summer the program will be located at South Orange Middle School. Specialty classes range from coding and a musical theater camp to TV production and wizard camp—and nearly everything in between. Sports offerings include basketball, fencing, track, soccer, girls volleyball, and gymnastics. Call 973.378.7620 or visit somadultschool.org for more information. MMS SCHOOL STORE: Let’s keep spreading the love to the MMS School Store! The School Store Wish List is HERE. Or donate funds via Pay Pal HERE. Or drop off items you purchase in the Main Office. In addition to snacks and waters the School Store would love to have school supplies in its inventory. Please contact Ms. O’Sullivan at mosulliv@somsd.k12.nj.us to coordinate any deliveries or to ask questions. Thank you! TISSUES NEEDED: It’s allergy season and Nurse Porter has put in a request for tissue boxes in all classrooms. If you’re willing to donate, please have your student deliver any boxes to their first period teachers. Thank you! Have a great week, and see you Thursday at School in Action Night!